A powerful middle-grade graphic novel about a soccer team full of misfits and the unlikely friendships forged on and off the field. Faith, an introverted fifth grader with a vivid imagination, starts middle school worrying about how she will fit in. To her surprise, Amanda, a popular eighth grader, convinces her to join the school soccer team, the Bloodhounds. Having never played soccer in her life, Faith ends up on the C team, a ragtag group with a tendency for drama over teamwork. Despite their losing streak, Faith and her fellow teammates form strong bonds both on and off the soccer field, which challenge their notions of loyalty, identity, friendship, and unity. 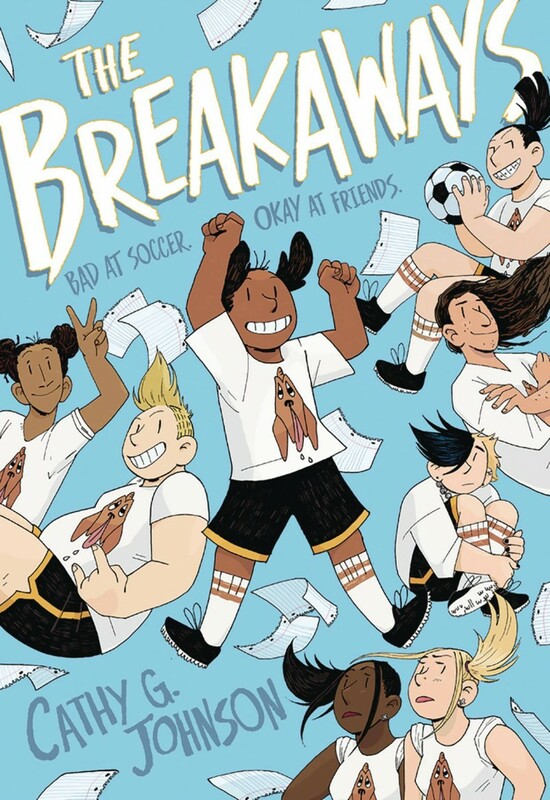 The Breakaways is a positive exploration of the complexity of female friendships, as well as the ups and downs of middle school life. Cathy G. Johnson brings this diverse and spirited group of girls to life with her joyful art style and honest, thoughtful writing.